against Holland in 1663, followed by the Dutch invasion of the Medway ; the treaty of Nimeguen ; and, finally, the arrival of a Dutch ruler to take the reins of Government, But upon this fresh phase of affairs I must dilate in my next chapter, only pointing out here in passing that, so far as cabinet work is concerned, the Flemish or Dutch influence is very clearly to be traced in Fig, 4, Plate I.; Fig. 7, Plate III. 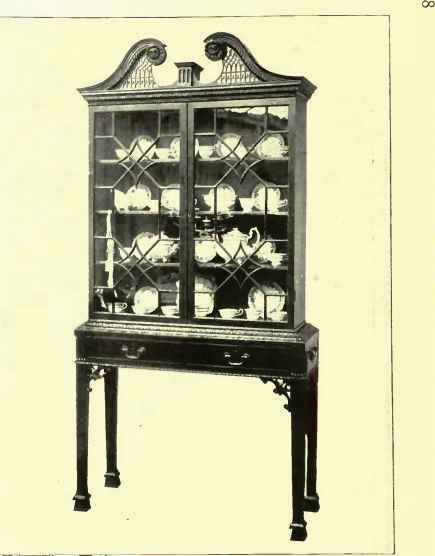 ; in the linen press, Fig. 4, Plate V. (most probably actually of Dutch manufacture); Fig. 8, Plate VI. 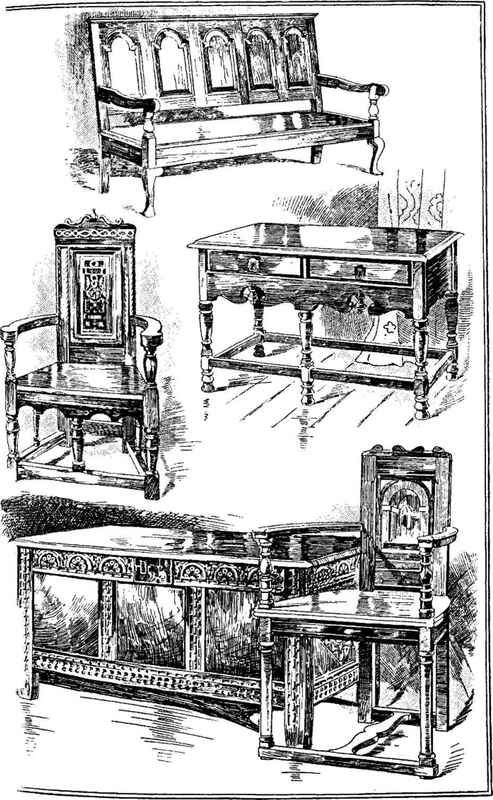 ; and the side table, again, Plate VII. Before leaving the consideration of " Jacobean " cabinet work I would draw the attention of the reader to the improvement that steadily grew in the character of the turning introduced—as, for example, in Fig. 4, Plate II., Fig. 5, Plate III., Fig. 4, Plate V., and the side-table, Plate VII. But turning is a feature that may be studied to greater advantage in the chairs of th^ time, and they must constitute the subject of our next deliberations. An examination of late "Elizabethan" and early "Jacobean" chairs of every kind leads us irresistibly to the conclusion that the days when they were in fashion must have been a veritable harvest-time for the timber merchants; for, if we take their weight alone into consideration, almost any one of them when put into the scale would bring down the beam against three or four of its twentieth-century successors. It was evidently a generally accepted belief in those days that sturdiness—one might almost say " clumsiness "—was inseparable from strength ; and just as the most notable deeds of old are associated in our minds with grizzled heroes of rough exterior and well-knit frame, so our forefathers of the seventeenth century liked to have as much weight and bulk of timber as could reasonably be secured in those articles which were destined to bear the brunt of the roughest usage.